Today there seems to be a resurging interest in local grains and heirloom grain varieties. (I have listed several resource books, documents and websites at the end of this article.) When we think of wheat today, most envision large combines on the Great Plains or Pacific Northwest. People are waking up to the idea that grain crops used to be grown on small farms throughout the United States, outside of today’s commodity wheat production regions. I remember my dad and me planting a 15-acre bottom field in wheat using my grandfather’s steel-wheeled, 9-hole Oliver grain drill with a wooden grain box. My dad bought it for my grandfather new in 1952 before he went into the army. A neighbor would custom combine the field using an old John Deere combine. Dad raised beef cattle and he wanted the wheat for straw bedding, not for grain. At that time, most wheat producers had moved to short straw wheat, since it was bred to yield more and have shorter stalks to prevent lodging. My dad searched for and found an old wheat variety (he doesn’t remember the name) which had long stalks to increase the straw yield for livestock bedding. We saved the seed for replanting over several years. Some years we kept the grain to use in livestock rations. We would sack it up (and tie the bags with a miller’s knot) and haul it to the local feed store, where Dad would have them mix and grind it with other grains for a balanced ration. If we sold the wheat, the feed store would take a sample, measure the moisture content and count onion bulbs. Your payment would be docked based on the number of bulbs counted. Dad wouldn’t spray for onions, since he sowed red clover in the wheat in February and would cut the wheat stubble/clover for hay. Red clover is a biennial, and for the next year we would cut and bale red clover for hay, then replant wheat. I liked baling wheat straw. It was clean, the bales were light, and you could stack a lot on the hay wagon. Red clover made great hay for livestock, but it was dirty to bale. While we didn’t make our own flour, we did raise grain on a small scale. Today many small scale vegetable crop and livestock producers view small grains as either a cover crop or for grazing. The idea of harvesting the grain crop to make flour doesn’t fit our modern way of thinking. You mean you can grow your own grain, harvest it, and grind it for baking? Yes, but not as easily as it used to be. There is also the possibility of growing your own straw for mulching the garden. We have lost the ability to harvest grain with scale appropriate equipment along with easy access to heirloom varieties. Modern combines are large and ill-suited for use in small fields. The modern combine got its name because it “combined” separate activities into one smooth operation. Some individuals restore small pull behind combines to harvest grain and they work fine, but parts are hard to find and maintenance can be difficult. You can buy small grain mills to home grind your own flour, but finding seed for planting old (heirloom) wheat varieties is a little more difficult. You also need to find seed in sufficient quantities to plant larger areas, just like planting cover crops. 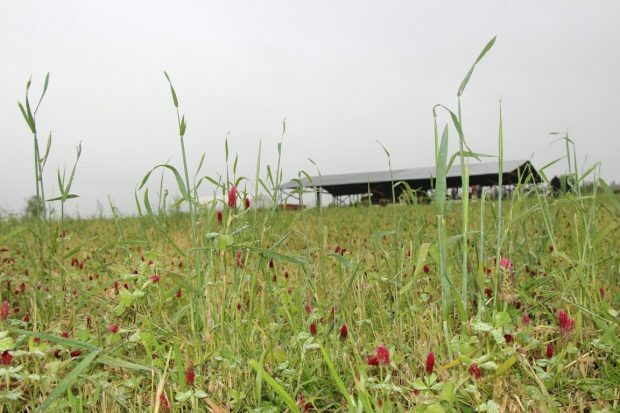 If you have the equipment to plant a cover crop, you can plant a grain crop. Harvesting is a challenge without good equipment. Yes, you can harvest with a scythe, thresh the grain, and then winnow it to remove the chaff. It sounds romantic, but it’s slow, hard work. I’m not opposed to hard work, I just like to work smart when I work hard, and that means incorporating some modern technology into the harvest. If small-scale grain production is ever going to succeed, in my opinion, we need scale-appropriate, quality harvesting equipment. A small combine would be great and even necessary for commercial-scale production, but a separate bundler and a thresher would also work on a much smaller scale. Numerous examples of small-scale harvesting, threshing, and grain cleaning equipment are available online. I find it frustrating other countries have access to such technology, while it is expensive and hard to get here. You also need to be able to test the grain for moisture content and mycotoxins, and store it properly for use as food. The book The Organic Grain Grower discusses issues surrounding harvesting, testing, and storing grain for human consumption. If you want to try baking with your own home-ground grain, there are sources of whole grain available to purchase for home use. Search the internet if you are interested in trying it. Can producing small grains be profitable and beneficial to a small farming operation? The interest is there among growers, but due to production costs, producers must charge higher prices than store-bought flour to break even. We have already discussed the issue of scale-appropriate equipment. I see it as an integrated niche for small vegetable/livestock operations, rather than a stand-alone system. The following resources are listed in no particular order. The article from Growing for Market is authored by Amy Halloran, who also wrote one of the books listed. I have access to the books listed, but have not had time to read all of them. The most comprehensive book to date is The Organic Grain Grower. As far as the cookbooks go, you’re on your own. I am not a cook, but wanted to list a few in case someone was interested in baking with flour ground from your own grain or wished to try using some of the more primitive grains. There are numerous books available on bread making and using whole grains, which may or may not be useful with home-ground flour. There is an internet article on pitchforks at the end. I listed it as a historical reference because most people don’t know that two- and three-prong pitchforks were used to toss wheat bundles for threshing, 4-5 prong forks were for manure handling, and then there are silage forks. I have used all but the two-prong. ‘Grains for Vegetable and Flower Growers,’ by Amy Halloran. Growing for Market 25(6), June-July 2016. ‘Going Against the Grain,’ by Alistair Bland. Slate.com, June 2013. ‘Growing Wheat of Your Own,’ by Sara Pitzer. Mother Earth News, February/March 2010. The New Bread Basket, by Amy Halloran. Chelsea Green Publishing, 2015. Small-Scale Grain Raising, 2nd ed., by Gene Logsdon. Chelsea Green Publishing, 2009. The Organic Grain Grower: Small-Scale, Holistic Grain Production for the Home and Market Producer, by Jack Lazor. Chelsea Green Publishing, 2013. Restoring Heritage Grains: The Culture, Biodiversity, Resilience, and Cuisine of Ancient Wheats, by Eli Rogosa. Chelsea Green Publishing, 2016. Homegrown Whole Grains: Grow, Harvest, and Cook Wheat, Barley, Oats, Rice, Corn and More, by Sara Pitzer. Storey Publishing, 2009. Both a how-to-grow book and a cookbook. Suited for small scale. Think backyard/garden sized production. All American Waves of Grain-How to Buy, Store and Cook Every Imaginable Grain, by Barbara Grunes and Virginia Van Vynckt. Henry Holt and Company, 1997. Cooking with Ancient Grains, by Laura B. McBride. CreateSpace, 2013. The Einkorn Cookbook: Discover the World’s Purest and Most Ancient Form of Wheat, by Shanna Mallon Fair. Winds Press, 2014. Einkorn: Recipes for Nature’s Original Wheat, by Carla Bartolucci. Clarkson Potter, 2015. *Books are available on quinoa, amaranth, teff, spelt, sorghum, and other whole grains. -Mini hand held battery powered combine. It’s mainly for research plot work and harvesting enough grain to see if a field ready to combine. Might work for harvesting small quantities to save seed. I listed it to show what technology can accomplish on a small scale. While this is written strictly for large scale commercial grain producers, it does discuss how wheat develops, disease and insects issues and harvesting in Georgia. The information should work for growers in the southeast. The Stewardship Ranch works to showcase native pollinator habitat maintenance and development strategies. 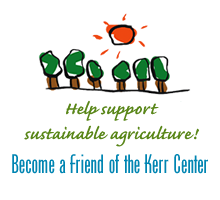 Find out more about the Kerr Center’s work.